I use closed-source scientific software for my work. I also use GPL licensed tools and libraries. It would save me a lot of time to be able to call a GPL library directly from the closed-source software. The closed-source program can be extended with "plugins" that are written in C, run as a separate process, but need to link against a closed-source IPC library. Can I write a plugin to interface the closed-source software with the GPL library, for my private use? Can I distribute the plugin as a compiled executable? Can I distribute the source code of the plugin so others can compile it on their own computer? I intend to release the plugin code under the most permissive open source license possible while still complying with the GPL. That question refers to a GPL host application with closed-source plugins. My question is about a closed-source host with a plugin that uses GPL libraries. It's not clear to me if that makes a difference. My understanding is that the way the plugin attaches to the host application is very relevant to the GPL's restrictions. If the plugin is a separate executable that the host launches and pipes textual input to, the restrictions don't apply. The "attachment" method I described above is somewhat atypical: the plugin is a separate process and communicates with the host through a proprietary interprocess communication method. To achieve this, the plugin executable needs to statically or dynamically link to a closed-source IPC library. Possibly at this point it won't even matter anymore that this executable is a plugin and distributing it is clearly forbidden by the GPL? Note that it is very difficult to determine whether two programs are actually separate works, and separate-processes factor appears to be a strong indicator of independence, but is probably not 100% dispositive. The copyleft of the GPL library causes your plugin to be covered by the GPL, but not the main application, which is probably a separate work. Distributing software in this configuration is a GPL violation, since you cannot satisfy the GPL terms for the proprietary library. 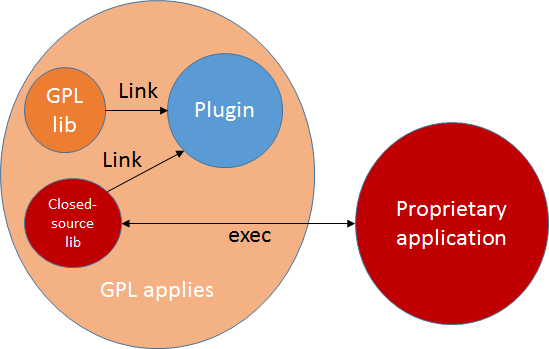 As above, the GPL does not apply to the main application, but it does apply to the proprietary library linked by the plugin, which causes a distribution-time violation. Yes. If you do not distribute any software, the GPL never imposes any requirements on you. You may do anything you like with GPL-licensed software without fear of violating the GPL if you are the only person ever involved in those operations. Your whole plugin is covered by the GPL, since it links to a GPL library. Therefore, when you distribute your compiled binary, it must be accompanied by the source code per the requirements of the GPL. You cannot provide source code for the proprietary library, so you cannot distribute the plugin without violating the GPL. You can distribute the source code. I anticipate that your program's reliance on the GPL library would not cause the GPL to apply to the source code in isolation, so you can probably distribute your isolated source code under any terms you like (but you may wish to verify this with a legal professional first). Yes, the GPL does not affect private use. This is both due to private use exception in copyright law, and because the GPL explicitly says that it only applies to distributions of "something" containing GPL code. The "attachment" method I described above is somewhat atypical: the plugin is a separate process and communicates with the host through a proprietary interprocess communication method. To achieve this, the plugin executable needs to statically or dynamically link to a closed-source IPC library. First: GPL requires you to provide source code when you distribute your program in combination with GPL-code. Can I distribute the executable and just provide the source code to my plugin? If you cannot convey a covered work so as to satisfy simultaneously your obligations under this License and any other pertinent obligations, then as a consequence you may not convey it at all. Since you cannot provide source code for the closed-source IPC library, you cannot distribute this executable, even if you provide all the source code to your own work. If the IPC library were open source too then you could distribute the plugin executable, but you would be obliged to provide source to all its components to downstream recipients. Yes. The source code to plugin is yours, it does not come under GPL just by having the potential to be linked with GPL. You can do with as you please. If you want to distribute it to others, so that they too may enjoy its use under the law's private use exception, that does not violate the GPL license.